Florida Sen. Marco Rubio will deliver Republicans' response to President Barack Obama's State of the Union address on Tuesday, GOP leaders announced Wednesday. House Speaker John Boehner, R-Ohio, and Senate Minority Leader Mitch McConnell, R-Ky., selected Rubio -- an influential Latino conservative who was first elected in 2010 -- to speak for Republicans in their official response to the president's speech. The State of the Union response slot is often seen as a potential launching platform for politicians who harbor national ambitions; fittingly, Rubio is one of the most-hyped figures in the GOP, and is thought to have designs on the party's presidential nomination in 2016. The honor carries a degree of risk, however: many past figures to deliver their party's response have been panned for their performance. Republican Sen. from Florida Marco Rubio speaks at the BuzzFeed Brews newsmaker event in Washington on February 5, 2013. 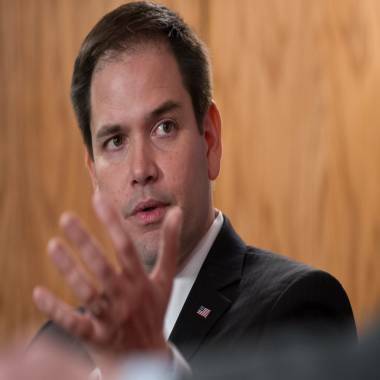 Rubio has also helped take the lead recently in working with a bipartisan group of senators to craft a comprehensive immigration reform bill that allows a pathway to citizenship for undocumented immigrants. Rubio has worked to sell that legislation to conservatives, just as immigration is sure to figure prominently in Obama's yearly address on Tuesday. "His speech will focus on the Republican Party's agenda to grow the middle class," a Rubio aide said. "Immigration will likely be mentioned as one way to grow the economy, but the speech really is about the Republican Party's commitment to limited government as the best way to help the middle class, and how it differs from the President's plans for bigger government." "Marco Rubio is one of our party’s most dynamic and inspiring leaders. He carries our party’s banner of freedom, opportunity and prosperity in a way few others can. His family’s story is a testament to the promise and greatness of America,” Boehner said in a statement. Added McConnell: "Marco Rubio embodies the optimism that lies at the heart of the Republican vision for America. On Tuesday, he will contrast the Republican approach to the challenges we face with President Obama’s vision of an ever-bigger government and the higher taxes that would be needed to pay for it."